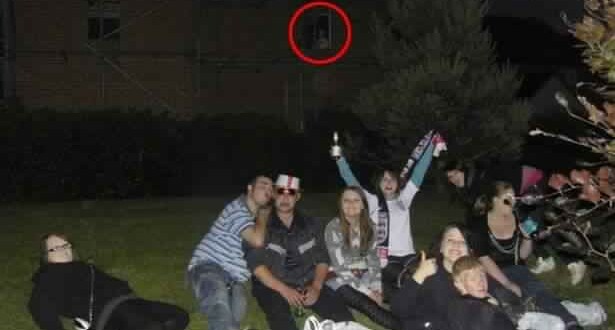 ‘Ghost woman and baby’ spotted peering out of new housing estate window. Natasha Oliver, 22, and a group of friends were out after watching a football game when they decided to capture some photographs. The pals, who were drinking in Wem, Shropshire, got photobombed by what they believe to be a ghost. A spooky figure, which kind of looks like a petite woman holding a baby, appeared in the window of the building behind them. Which probably killed any party spirit, TBH. The snap was taken after a World Cup game five years back, but Natasha admits she’s still creeped out by it. The building was being constructed on the site of an old wood yard, but the structure wasn’t complete so nobody was living inside it. ‘It’s on the site of an old wood yard so there would have been people working here. It could be any one of the workers,’ she told the Mirror.